Finding that dream wedding lehenga might just be easy this summer. Designers are vying for attention with silk drapes, light embroideries, and chiffon fabrics, all of which come together to create pieces that are not just beautiful, but also light (and that’s the dream, right). Gone are the days when one wore a 5kg lehenga with heavily-embellished dupattas and a big pallu in the sweltering heat. Brides nowadays are opting for fabrics that are light as air, embroideries that are minimal, and instead of zardosi, prints. Dupattas too are casual, with sheer and net ones upstaging the velvet, heavy kinds. We discovered a few summer-friendly lehengas for brides who like to keep it effortless and easy. Mrunalini Rao keeps it fresh with heavily embellished blouses in muted hues to pair up with breezy, light floral lehengas. 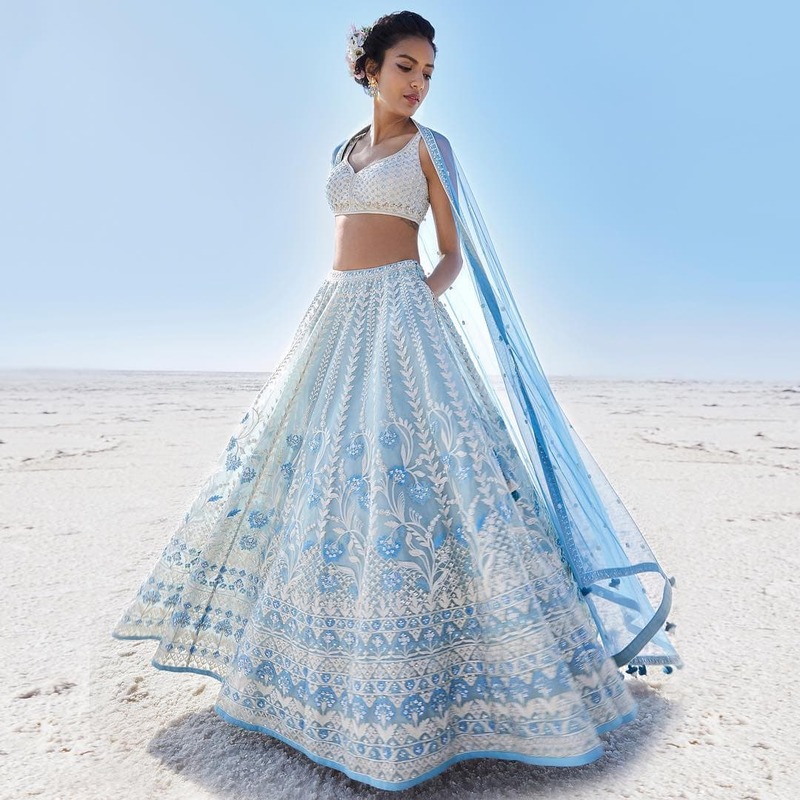 Anita Dongre‘s newest collection, Blue Moon Magic – A Summer Reverie 2019, is all about whites and blues. The ‘gota patti’ is prominent but the muted hues make it a minimalist beauty. The trend with summer shades is slowly but surely shifting towards sorbet colours. With mints, dusty roses, and light blues, and Sabyasachi‘s colour palette is clearly pointing out to this trend. This unique embellished scallop detailing jacket lehenga by Ridhi Mehra is an effortless style to pull off. This two layered Lilac Lizzie with silver rose detailing on luxe raw silk by Natasha Dalal is as contemporary as it gets, given its two layers, added depth, and volume. Manish Malhotra doesn’t often do lightweight lehengas but this time, he hit the ball out of the park with this beautiful pink piece with embroidered borders. Peach is a beautiful summer shade and with net and organza additions alongside subtle sequin work, we have a winner by Abhinav Mishra. Neutrals are all over Indian runways, and have also seeped into bridalwear. This Devnaagri lehenga in soft sheer drapes from the Aaftab, Spring Summer 2019 collection balances muted tones well. Tiered lehengas follow the cocktail dress route and are fast becoming a trend to work into the destination wedding catalogue. This blue with silver borders and an intricate embroidered blouse by Seema Khan balances the look beautifully for the summer. Vasansi is known for its traditional embroideries and colours, but in this piece they incorporate a fun element with canary yellow tones and embroideries. Kresha Bajaj, the queen of florals, has once again created a dreamy fairytale look for the summer bride with soft blues and pinks, embroidery, and intricate blouses with sheer detailing.